Nice, clean and recently renovated hotel in quiet location at North end of Pattaya Beach, but within easy easy walking distance of all Pattaya's tourist attractions. Eager and friendly staff. Unfortunately, only one restaurant so limited food choice in hotel, but many excellent eating options nearby. Where to find Pattaya hotels near an airport? How can I find hotels in different Pattaya neighborhoods? 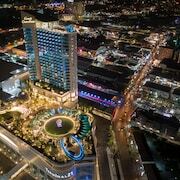 Where can I find hotels in Pattaya that are near tourist attractions? There are many lodgings to choose from for those who are searching for a place to stay in or near Pattaya. The Expedia database contains 689 places to stay within a 0.1-kilometre (0.06-mile) distance of central Pattaya. Why not book a convenient spot close to Pattaya's heart? The Mike Garden Resort Hotel and Le Vernissage Hotel are conveniently located a short distance of the downtown area. 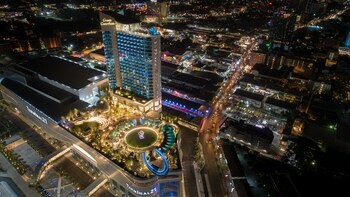 Pattaya Bay, a popular Pattaya accommodation neighborhood with 153 hotels is 3 kilometres (2 miles) from downtown. 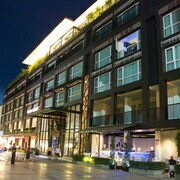 The Hilton Pattaya and Dusit Thani Pattaya are amongst the hotel options in Pattaya Bay. Alternative areas with a range of hotels include Chonburi and Laem Chabang. The Royal Sammuk villas and Chon Inter Hotel are in Chonburi, while Laem Chabang is where you'll find the Basaya Laemchabang and Laemchabang City Hotel. Naklua Bay is 7 kilometres (4 miles) from Pattaya's downtown, while Si Racha is 25 kilometres (15 miles) from the heart of Pattaya. The Cholchan Pattaya Resort and Bella Villa Cabana can be found in Naklua Bay, while Cape Racha Hotel and Nara Residence are situated in Si Racha. The The Magnolias Pattaya Boutique Resort and the Lake Villas Resort are near the Three Kingdoms Park. The The Magnolias Pattaya Boutique Resort is 3 kilometres (2 miles) away from the Three Kingdoms Park. The Lake Villas Resort is 3 kilometres (2 miles) away. At Expedia, we know that travelers have differing needs and budgets. So if you're searching for a room at the more affordable end of the scale, the Pattaya area features some great options to choose from. 4 kilometres (3 miles) away from Pattaya's downtown is where you'll find the Suksabai Residence. The Le Vernissage Hotel is only 0.8 kilometres (0.5 miles) away. Other affordable accommodation options include the Miracle Suite and the Nova Platinum Hotel. 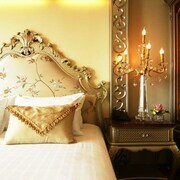 You could investigate the The Chase and Foxlea Executive Villas and the Royal Wing Suites & Spa. 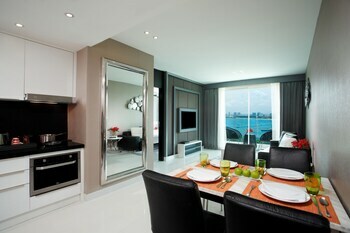 The The Chase and Foxlea Executive Villas can be found 8 kilometres (5 miles) from downtown Pattaya. The Royal Wing Suites & Spa, is positioned 5 kilometres (3 miles) away. The Centara Grand Mirage Beach Resort Pattaya and also the Palm Grove Resort are two more Expedia-listed places to stay in Pattaya. After you have got to know Pattaya, you should leave time visit the many other delights of the East Coast Thailand area. East Coast Thailand boasts rural landscapes, beaches and rainforest, and commonly visited East Coast Thailand sights include traditional villages and shrines. In this part of Thailand tourists may also enjoy mountain biking and mountain climbing. Looking for more to do? Consider spending a few hours exploring Big Buddha Temple and Pattaya Exhibition and Convention Hall, in Pratumnak Hill, 5 kilometres (3 miles) to the southwest of Pattaya. Pratumnak Hill hotels are the InterContinental Pattaya Resort and AVANI Pattaya Resort & Spa. Alternatively, you could consider staying at Ban Chang, 30 kilometres (19 miles) to the southeast of Pattaya, where you'll find the Royal Phala Cliff Beach Resort and Spa and Banchang Palace Hotel. The Eastern Star Golf Course and Emerald Golf Resort are a couple of the most popular points of interest to check out for those visiting Ban Chang. Now you've explored the hotel options in Pattaya, take the time to visit Expedia's Pattaya travel guide for the inside scoop on cultural and scenic attractions here. What are the most popular Pattaya hotels? 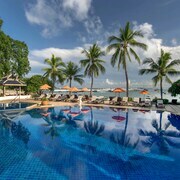 Are there hotels in other cities near Pattaya? What other types of accommodations are available in Pattaya? 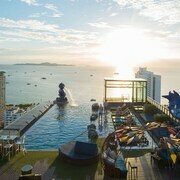 Explore Pattaya with Expedia.ca’s Travel Guides to find the best flights, cars, holiday packages and more! Flights from Hancock Intl. to Fort Lauderdale Hollywood Intl. Flights from Kelowna Intl. to Logan Intl. Flights from Calgary Intl. to Rick Husband Amarillo Intl. Flights from Bradley Intl. to Stanfield Intl.